Anticipation mounts as the sky slowly darkens. A year and a half of planning and preparation have brought us to this moment. What will it be like? Will it be worth it? I’ve seen partial solar eclipses before, lunar eclipses also. To say I’ve been underwhelmed would be an understatement. Yes, it is interesting and fun, but at least to me, they didn’t live up to the hype and I wouldn’t have gone too far out of my way to observe them; certainly not a thousand miles and long hours of driving, not to mention the many hundreds of dollars out of pocket. However, those who have experienced totatilty have, to a person, said it would be worth it. My wife and I are at her cousin’s farm in rural Oregon. I brought up the topic of visiting her for the eclipse eighteen months ago. “Sure”, Ann said. For a long time it was just me and Ruth going. Things changed as ‘eclipse day’ got closer. More people wanted to come. It became a small family reunion and a multiday party; which is great, because even if the weather were to be a bust, it would still be fun. And given a choice, I would much rather experience this with people dear to me, than a throng of strangers. The sun rose this moring to a clear sky, perfect weather! A delicous farm breakfast, coffee, and mimosas ensured we wouldn’t be thinking about food until the event was complete. 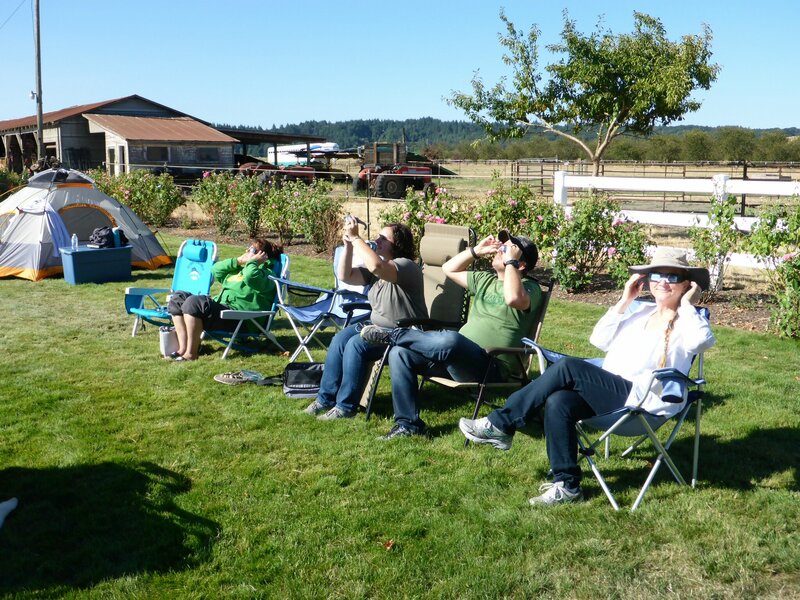 Armed with our ISO certified eclipse glasses we watched the moon cover more and more of the sun. Soon more of the sun was obscured than I had ever witnessed before. Exciting, but not really impressive. More time passed, you could detect a difference in the ambient light; then there was just a crescent of the sun shining through. The temperature was dropping. All eyes were focused on Sol. Magical. That is the best word I can use to describe the experience. 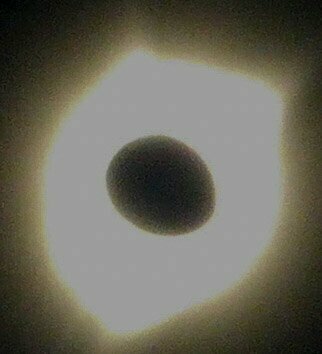 The rationalist will talk about the science of the eclipse, about the cosmic coincidence of the size and orbit of the moon and how it perfectly creates this effect. But coincidence is not a kosher word. (Triva: There isn’t a single word in Hebrew which translates as coincidence.) I had traveled to too many places this short summer, seen to many things created by ‘happenstance’ or ‘geological forces over eons of time’, to believe it is all an accident of random chance. Many generations have thought they knew all that was knowable. They have all been wrong. There is always more to know. We continue to learn new, often surprising, things. There is still so much we have yet to learn about ourselves and our planet to dismiss magic and mystery and faith. Science is of vast importance. You don’t launch rockets to the stars without it, but there is also a place for mystery in our lives, as well as the humility to admit our understanding is imperfect, and probably always will be. History is full of examples about the dangers of hubris; I’ll try to stay a little humble. All too soon we glimpse the ‘diamond ring’, the sign totality is over. Not nearly long enough. It is easy to understand the passion, the obsession, that drives people to travel the world to view eclipses again and again; to once more, if only for a few fleeting minutes, experience the awesomeness of totality. There would be hours of traffic heading back to Portland so Ruth could make here very early flight, and I will be continuing on my journey, visiting more family and friends, and enjoying the beauty of the Pacific Northwest, but it is hard, nay, impossible to imagine anything more special than what we had shared these past few days.